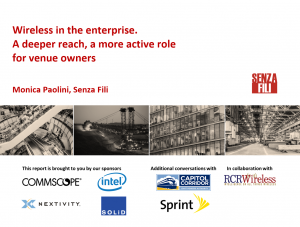 The enterprise is ready to take a larger role in wireless connectivity, as its needs for indoor coverage, for enterprise- and location-based services, and security grow. The report looks at what is changing in the enterprise – technology, architecture, business and ownership models, services, and relationship with operators. As the enterprise relentlessly moves to wireless as the default communication modality in all locations, the role of wireless connectivity changes and performance requirements grow. Wi-Fi continues to be the fundamental technology for indoor data traffic, but cellular and other technologies play an increasingly important role – and one that requires integration and coordination among technologies. The rise of IoT, IIoT, and private networks accelerates this process and extends its scope.